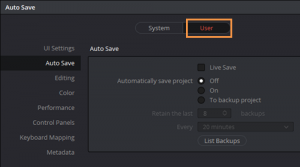 One of the most important preferences to get understood is how Auto Save works in Resolve as the choice you make can have a big impact on the way you can access previous versions of your project. 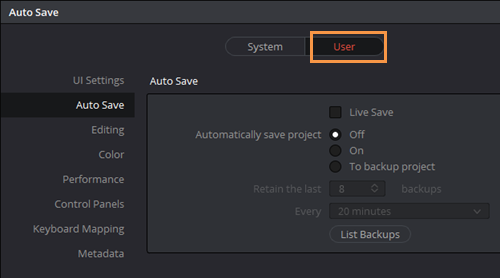 Auto Save is found under the ‘User’ tab of the preferences. The first option is ‘Live Save’ and you need to be sure that this is something you wish to use. I don’t personally use this. … and this can be a real help. But for me, the best option is to use another auto save function. 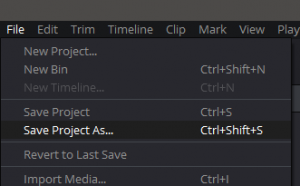 ‘Automatically save project’ when turned to ‘On’ is the same a simply doing an Edit>Save (or Control/Command + S) which saves the project at its present state overwriting the previous version at whatever time interval you specify. Again, this isn’t a great help unless you are the kind of person who forgets to do a regular CNT/CMD + S as you go along (a good habit to get into). 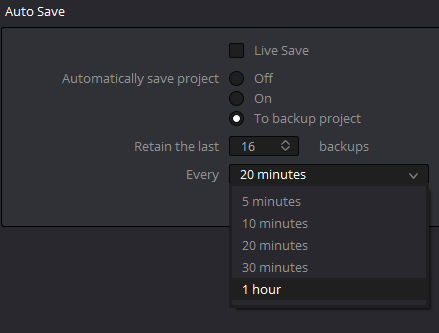 But again, this doesn’t let you get back to older versions very easily AND if you shut Resolve down, you may lose the contents of the ‘Undo History’ panel so not be able to go back when you start up Resolve again. The version I use the most is the ‘To backup project’ option which will allow you to save up to 16 versions of you project at up to 1 hour intervals. So, should you need to go back to a previous version, you could have up to 16 hours of previous versions backed up and be able to go back to any of those if you wish. Obviously, once you have made your choice for Auto Save, make sure to hit ‘Save’ at the bottom of the dialogue box. One last thought. If you do make an important change to your project and are using ‘Live Save’ (or any other version of auto save) you can always use the ‘File>Save As’ command. … and simply add a ‘1’ to the end of the project name to create a new version and save the old one at its present state in case you ever need to go back.